The Royal Canadian Mint is rolling out a series of colorful 25-cent coins featuring three of the country's most famous mythical creatures. Up here in the Great White North, we like our currency to have a little zing. We've got loonies, we've got twoonies - the two-dollar bill was actually a real thing here until it was replaced by a coin - and when it comes to paper money, it's colors, not numbers, that are important. And now we've got what is possibly the most awesome coinage of all: a set of three quarters emblazoned with three of the country's cryptids in full, glorious color. A cryptid, for those not in the know, is a creature of legend, an animal which has never been proven to actually exist, like the Loch Ness Monster, the Jackalope or the Sasquatch - which features on one of the three coins. Sasquatch is easily the most famous of the three and the only one that most people, Canadians included, will immediately recognize. 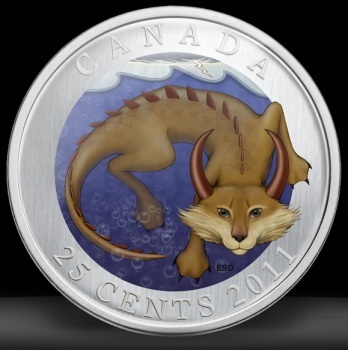 The second coin features Memphre, the "lake dragon" who lives in Lake Memphremagog in Quebec and is believed to be very much like Nessie, and Mishepishu, "the Great Lynx," a shapeshifter who roams the Great Lakes. All three coins featured the likeness of Elizabeth II, D. G. Regina, long may she reign, on the flipside. The coins are legal tender but probably won't be tossed onto too many shop counters, as their 25 cent value pales next to their 25 dollar cost. Obviously you're not going to pick up a roll or two to blow at the laundromat, but as a collector's item, a cool birthday gift for the kids or just for something to wave in the faces of friends whose money is all green and boring, I think these things are about as cool as a coin is going to get.